Here are basic instructions to help you execute a PowerShell command. You have a choice of three strategies; firstly, the time-honoured method of copying other people’s examples, and then pasting their code into your PowerShell session. Secondly, creating your own scripts, and thirdly, simply typing the instructions at the PowerShell command line. In PowerShell v 2.0 and later it’s easier to use the ISE graphical version. 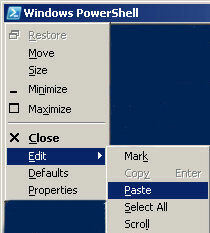 This is how to copy and paste PowerShell instructions to the command line version. Since the aim is to learn a technique, the practice code does not matter. Most people use ‘Hello World’, as their test ‘vehicle’; however, I prefer to choose a real example. For instance, here is a cmdlet which gets the operating system processes, and then groups them by company name. Result: You should see a list of processes grouped by Company name. Note: Ft is an alias for Format-Table. Sort-Object has an alias of plain sort, which we use in the next script. a) Check and amend the value of $Path. b) Remove the # from the beginning of the last line. Note: PowerShell’s Get-Command returns so many cmdlets that I have incorporated a filter so that it just lists cmdlets beginning with ‘get’. You could replace -verb get with the wildcard *. Because it saves your instructions permanently into a text file, this cmdlet method is an improvement over copy and paste. Creating cmdlets is my favorite technique because it is ideal for making amendments, then re-running the commands. As a bonus, cmdlets keep a record of what I have done. Tip: For each of my PowerShell projects, I launch Windows Explorer and then create a subfolder. Once I have a cmdlet that works, I store it in that subfolder. Thereafter my technique is to call for: File (menu), SaveAs, create a new file. Then I work with the new file and try to improve on that original version. At various points I call for SaveAs again, thus creating a family of cmdlets, for example: addcontenta, addcontentz, addcontenty etc. My reason for employing this cmdlet technique is twofold, firstly, to cater for that moment when my code gets into a tangle, and I think: ‘If only I could go back in time to when my script WAS working’. Well, thanks to saving lots of intermediary examples, I can revert to a working backup. Secondly, producing cmdlets means that I can return to my research months later and pick up from where I left off, instead of starting the project from scratch. You may like to combine methods 1 and 2 by copying other people’s code then pasting, not to the command line, but into a cmdlet text file. See more on creating cmdlets. Because PowerShell commands are so efficient, and thus short, I have no qualms about recommending that you simply type them at the command line (or in PowerShell 2.0, in the ISE GUI). To test method 3, I have different examples or ‘Vehicles’. You could start by typing this at the command line: Get-Childitem c:\windows. Get-Help -eventlog (Wrong: ‘Overthink’ eventlog is not a parameter or a switch, it is a positional argument and thus does not need a dash. abc-xyz | GM. (GM is an alias for Get-Member). Typical Microsoft, there are always at least two ways of executing PowerShell code. By all means start with the time-honoured method of copying and pasting, but for the long term, my advice is take the time to master the cmdlet method.